Mechanical Engineering is synonymous to Industrial Revolution that started after the invention of Steam Engine by James Watt. The branch of Mechanical Engineering is regarded as Ever Green Branch of Engineering and designed to provide analytical and experimental skills required for a wide variety of careers in Mechanical Engineering and also in other multi-disciplinary areas like Materials Engineering, Production Engineering, Industrial Engineering, Biomedical Engineering, Environmental pollution control, Computer sciences, Robotics and Management. The Department has built up all the facilities required for imparting excellent training to meet the challenges of the let century and has taken up the challenge to meet complex technological needs of the globe. Aims to prepare professionals with advanced knowledge of their respective fields to serve the industry through Research and Development. Through effective teaching and research related activities, the department seeks to strengthen the on-going process of churning out highly skilled technocrats. The department has highly qualiﬁed and experienced faculty on its roll. Many faculty members have research related as well as Industrial experience. Their consistent guidance to the students has been producing excellent University Results. Conducts periodical research oriented technical workshops and training programs for the benefit of the students. Adequate opportunities for learning and innovation through state-of-the-art lab faculties which are upgraded from time to time. Provides latest trends in the field of study through live projects in industry, seminars & assignments based on research papers and new techniques. The M.Tech programme in Machine Design (ME) is a research based programme that imparts the knowledge, skills and attitude to contribute to world class research in the area of ME. The research can be in any of the broad areas in ME such as Designing, Manufacturing andThermal Engg. It is two year full time regular programme afﬁliated to YMCAUST, Faridabad and approved by AICTE. Institute admitted its first batch of students in M.Tech Programme in 2012. The faculty actively participates in sponsored research and consultancy work, seminars/conferences and short-term courses. The teaching and research programs in the department are organized according to both disciplinary and inter-disciplinary themes. We cover all the core disciplinary areas of mechanical engineering including dynamics, controls, solid mechanics, materials, fluid mechanics, thermodynamics, production and design. The department has state of art laboratory and workshop facilities with modern sophisticated equipment to give practical exposure to the students and carry out research in areas related to mechanical and industrial engineering. Computer Aided Design Centre: Equipped with 30 computers, Solid works, CATIA, and AutoCAD software. 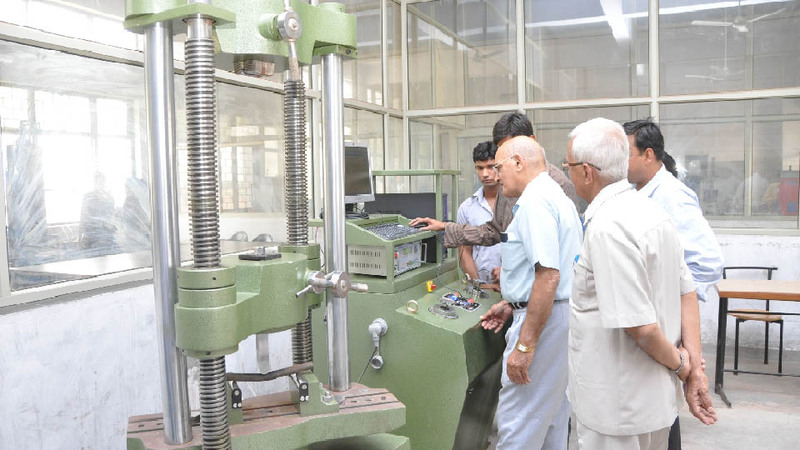 Computer Aided Manufacturing Laboratory: Equipped with CNC lathe machine specially designed control software, 15 computers, Master CAM Software. Lathe machine is fitted with eight station automatic tool changer and automatic cooling and lubrication. Strength of Material and Material Science Testing Laboratory:Equipped with 40 ton capacity UTM with attachments for compressive, shearing, bending and tensile tests. Other machines include Izod-charpy impact testing machine, Brinell testing machine, furnace, polishing machine and metallurgical microscope, etc. Automobile Shop: Department has well equipped labs like Engine Testing, Vehicle Maintenance, Chassis Component, Engine Component etc. These are the major equipments which are in our HT lab Thermal Conductivity of Metal Rod Apparatus, Thermal Conductivity of Insulating Powder Apparatus, Thermal Conductivity of Guarded Hot Plate Apparatus, Pin Fin (Natural Convection) Apparatus, Pin Fin (Forced Convection) Apparatus, Forced Convection Apparatus, Emissivity measurement Apparatus, Parallel Flow counter Flow Heat Exchanger, Stefan Boltzmann Apparatus, Heat Pipe Apparatus. In this lab major equipments are Vapour compressions Refrigeration Test Rig, Mechanical Heat Pump Trainer 1/3Tr,Air and Water Pump Trainer 1/3 TrCut Sectional Control Board of Refrigeration and Air Conditioning ,Air Conditioning Trainer Complete with Heating Cooling and Dehumidification & Humidification, Chilling Plant Test Rig with digital Meter. Major equipments of this lab are Bernoulli’s Theorem Apparatus, Reynolds Apparatus, Impact of Jet Vanes, Losses due to Sudden Enlargement & Contraction, Notches Apparatus, Pipe Friction Apparatus, Metacentric Height Apparatus, Losses in Various pipe Fitting, Determination CVCC & CD orifice meter, Closed circuit Centrifugal / Variable Speed Centrifugal Pump Test Rig, Closed Circuit Gear Oil Pump Test Rig, Closed Circuit Peloton Wheel Turbine 5hp,Closed Circuit Reciprocating Pump Test Rig,Francis turbine Test Rig 5H.P. Capacity. Prof. Vikas Kumar has teaching and research experience more than 10 years in various institutions. His major research interest includes CAD, Machine Design, Strength of materials, Refrigeration and Air Conditioning. He has completed his Masters of Technology (Machine Design) and BE in Mechanical Engineering from MD University, Rohtak. He has published 10 research papers in International and National Journals. He has attended many conferences and seminars in field of Mechanical Engineering at JC Bose University, YMCA, Faridabad. Prof. Kumar has guided more than 20 students in UG/PG projects and Dissertations. He also sharpened his career further with an additional qualification of MBA in Production and Operation Management. He has successfully implemented PMKVY and Non PMKVY projects.